Not like most people in Moscow live in palaces. There is a certain Russian expression: “Москва — не Россия” (i.e. Moscow, isn’t Russia), to denote the idea that while the capital may be rich, at least by Russian standards, the rest of the country languishes in grinding poverty. This is a trope is frequently taken up by the Western media, which at times presents the Russia outside Moscow and St.-Petersburg as a wasteland languishing in Third World-style destitution. It is also commonly implied that Moscow is growing fast in prosperity, while the rest of the country lags behind. And at first glance the statistics seem to confirm this, with salaries in Moscow for 2010 almost double the Russian average. 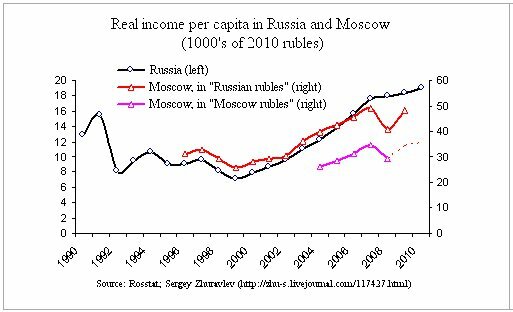 Income disparities are even greater, the average income in Moscow being 2.5 greater than in Russia as a whole. It accounts for about 20% of Russian GDP while only representing 7% of its population. But as is usually the case, there is an important catch. As argued in an excellent article by Sergey Zhuravlev, there are several factors dragging down Moscow’s real level of prosperity. First, prices for a fixed assortment of goods and services in Moscow are approximately equal to the OECD average, and higher than in the rest of Russia by a factor of about 1.4 (see Rosstat). 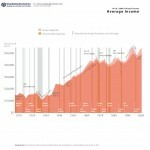 This means that a ruble of consumption in Moscow only buys as much as 70 kopeks in the provinces. 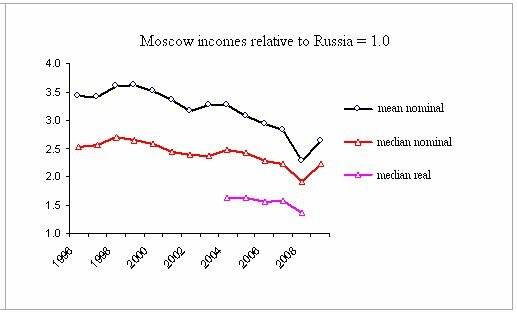 As a result, the 2.5 differential in incomes – this figure, by the way, is down from its peak of 3.6 in 2000, so in reality Moscow has grown substantially slower than Russia as a whole – is reduced to about 1.8 as of 2009. However, what’s more, Moscow’s level of inequality is the greatest in Russia (as one might expect of a city with so many billionaires). It’s Gini index of 52 is about 10 points above the Gini index for Russia as a whole. So the median resident of Moscow got only 36% as much income as the typical Russian in 2009 (albeit this figure would likely recover to its more typical level of about 50% after the recession). A disparity of this modest scale is fairly large but not completely atypical by developed country standards. Two conclusions follow. 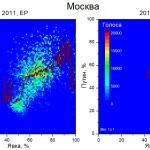 First, headline figures of the gulf of the inequality between ordinary denizens of Moscow and the rest of Russia overestimate its real extent due to their omission of price differentials and intra-regional inequality (both of which favor Russia). Second, the gap has been slowly narrowing over the past decade, as both incomes and prices in the Russian interior slowly converge to Moscow/OECD levels. This is not to say that Moscow is poor, far from it, most of its socio-economic and consumption indicators are at or near the top of the Russian regions (e.g. 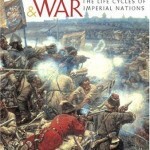 meat consumption, Internet penetration, etc). But for most people living standards are not cardinally different from what they’d experience in in any other Russian city.